At least 22 people have died in the US in an ice storm that has hit several states just east of the Rocky Mountains. Up to 800,000 homes and businesses have been left without electricity after icy winds toppled power lines and trees. Oklahoma and Missouri have been worst hit. Further ice storms are forecast for parts of Missouri, Kansas, Iowa, Illinois, Wisconsin and Indiana. Here are a selection of e-mails sent to the BBC News website from people caught up in the bad weather. We lost power three days ago. Now we have no water. Pretty much all of Nowata County is without power and water, and looks like an evacuation zone. There are no people, only dark houses. Pretty much everybody who can has left and found a hotel room elsewhere, although there are few of those around. I have gone back daily to feed the pets, and you can stand in the yard and hear the trees break -- it sounds like gunshots. Very creepy. The storm has knocked power out for almost the entire town and surrounding areas....most people are without heat. My apartment dropped to nearly 40 degrees Fahrenheit (4 degrees celcius) last night. As you drive around town, through neighbourhoods and such every single house has a tree or limb down in front of it, some streets you can't even drive down its so bad. It looks like a war zone. I have never seen this kind of destruction from an ice storm like this. Both colleges in town have cancelled finals for the semester because of power outages. I live in Tulsa and you would not believe what this ice storm has done to many of the trees. We could not drive through my street because of all the big limbs that were down. This is the worst I've ever been in. Now they are saying that it may be another 7 days before power is restored to everyone in Northeast Oklahoma. My family awoke this morning to find our power out, and the temperature in our home freezing. When I looked outside I was in shock. Large trees two feet thick were snapped in two due to the tremendous weight of the ice with which they were coated. Tree limbs were down in our backyard, destroying fences and resting in our swimming pool. Standing in my doorway I could hear the ominous sounds of tree branches cracking and crashing all around. It is unsafe to walk outside due to falling trees, downed power lines and sheets of ice sliding off rooftops. It looks like a war zone. 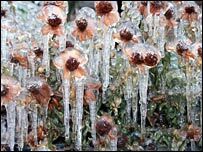 We are just beginning to see the effects of this new storm after last weekend's ice storm. Driving was very hazardous and will only get worse as we go further into the week. We have five inches of snow on the ground and two inches of ice on top of that. I dread to think what rush hour tomorrow will be like. We are in Kansas City, Missouri - in the metro area near the Plaza. It is 1:00 am Tues morning here and the tree in front of our house looks like it is made of blown glass. I am guessing we have a quarter inch coating of ice on everything. The ice storm of 2002 here was insane - we sat up and watched the blue arcs of transformers blowing through the night. We've had about 2cm of ice everywhere in the past 48 hours. Nearly all trees in the area have either fallen down or had large bits break away. The rain's stopped now but the branches are still falling down onto the roads and paths. We're supposed to have exams tomorrow but it doesn't seem particularly safe to do so. Send us your eyewitness comments using the form below. You can send pictures and video to: yourpics@bbc.co.uk or to send via mobile please dial +44 (0)7725 100 100. If you have a large file you can upload here.